The Thales One Display for a Cockpit Interactive Solution (ODICIS) future cockpit design, which this year won the prestigious, inaugural French Institute of Design’s Janus prize, demonstrates even more ground breaking functionalities and innovative functions at Farnborough 2012. Thales, world leader in cockpit systems, unveils further state-of-the-art innovations to its revolutionary interactive cockpit design, ODICIS, which seeks to shape the future of commercial and military avionics platforms. Addressing the emerging requirements dictated by high-profile programmes such as SESAR/NextGen and Clean Sky, Thales’s futuristic cockpit concept jumps even further ahead with the introduction of new state-of-the-art functions in order to comply fully with the future demands posed by the programmes. Programmes such as SESAR, NextGen and Clean Sky represent the true future potential of the aviation industry and Thales is proud of its leading role in SESAR. As the only player in the undertaking to have taken the leadership position in both the air and ground segments, Thales has supplied all the on-board and many of the ground surveillance and positioning instruments necessary for the successful completion of the I4D flight earlier this year. 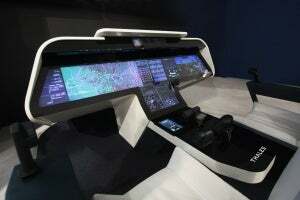 Because of this unique capability, Thales is the only player in the market to be able to develop a future cockpit concept capable of handling the host of new information which will need to be displayed to comply with these programmes and therefore the amount of data the crew will need to handle in the future. ODICIS at the Farnborough Airshow, displays all relevant information in a simpler and clearer fashion on a larger and more legible display to ease workload and complexity. With its touchscreen-based display concept, ODICIS can be configured to provide more freedom in how the display space and touchscreen surface are used, enabling information to be presented in new ways across all types of aircraft. This new technology draws on applied research work undertaken for the Cockpit 3.0 initiative and creates a crew-centric system with simpler and more instinctive human-system interfaces allowing the pilot to focus fully on the job of flying the aircraft whilst keeping the entire display area on screen. Commenting on these developments Richard Perrot, head of Thales Avionics’ marketing department, said: "As one of the world’s leaders in both aircraft avionics and air traffic management solutions, we are fully committed to make ground and air segments work seamlessly together. We are also deeply involved in improving system and interface management to design a new cockpit philosophy."